Place flour, sugar and salt into a large bowl. Cut butter into chunks, and add to the flour. Toss lightly to coat. Working quickly, using a pastry blender or your fingers, cut the butter into the flour mixture until there are only pea-sized chunks left. You want a few lumps of butter remaining. In a bowl, combine ice, water and cider vinegar. Spoon a few tablespoons of the ice water into the flour and butter mixture, using a spatula to combine. Continue adding water a tablespoon at a time until you have a dough that holds together well. Shape into two discs, one slightly larger than the other, and wrap in plastic wrap. Rest in the fridge for two hours to overnight. In a dry heavy saucepan cook the sugar over moderate heat, undisturbed, until it begins to melt, cook it, swirling the pan, until it is a deep golden caramel. Remove the pan from the heat, add the cream and simmer the mixture, stirring, until the caramel is dissolved. Add the chocolate and the salt and cook the sauce over low heat, whisking, until the chocolate is melted and the sauce is smooth. Whisk in the vanilla and fold in the nuts. Let cool slightly before using. Preheat oven to 425 degrees. On a lightly floured surface, roll out pie dough into a rough 12 inch circle. Place into a 9-inch pie pan. Chill in the refrigerator while you prepare the rest of the pie. Roll out the remaining dough into a large disc and place in freezer for 10 minutes until firm. Trace pie plate lightly over dough and trim out with a sharp knife. Using diamond cutters, stamp out pie pattern for pie top as desired. On the remaining dough, use a medium sized cutter to stamp out pieces for pie border. Transfer dough to fridge while working on pie filling. Peel and core pears and slice them into ¼ inch slices. Place them in a large bowl and toss with sugar, flour, spices, lemon juice and stir to combine. Add half the pears to the pie shell, drizzle with ½ cup of hazelnut caramel sauce, then top with remaining pears. Brush the pie edges with egg wash and press pie top to seal. Brush edges of pie top with more egg wash and layer diamond dough piece along edge for the crust. Slide into freezer for 15 minutes until crust is firm. 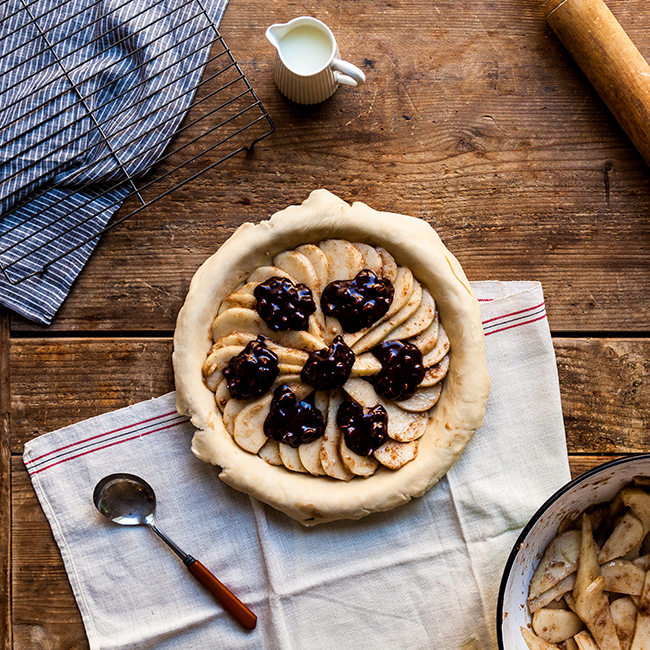 When you’re ready to bake the pie, place onto a baking sheet. Brush the top of the pie with egg wash and sprinkle with coarse sugar. Bake the pie until golden brown and bubbling, 45-55 minutes. If the crust begins to burn, tent loosely with aluminum foil. Cool before serving.